I walked into the boreal woods by myself today, but I soon realized I was not alone. He wasn't exactly making a secret of his presence. I encountered several scrapings in the wet mud - some so recent that water was still seeping into the hoof prints. He'd scraped the bark off of trees, crashed through speckled alder thickets, and left hug footprints in the sphagnum moss of a bog. The message was clear: if you were a rival, you'd better stay away... but if you were a receptive female, you were quite welcome. I wasn't out looking for moose, but rather for wetlands - in particular bogs and spruce swamps. I've been spending a lot of time in the Victory Basin lately, a remote part of the Northeast Kingdom of Vermont, characterized by incredibly cold winter temperatures and harsh granite-derived soils. The ecosystems in this basin are similar to those hundreds of miles north in the boreal forest of Canada... and while moose occur in most of Vermont they are especially abundant in this northern cold setting. 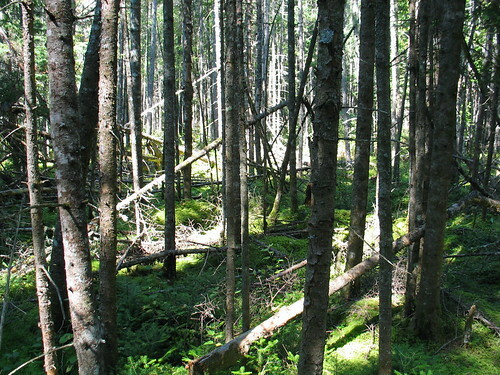 Above: Lowland Spruce-Fir forest, a landscape often inhabited by moose. After fighting through some dense vegetation I emerged on the shores of a large beaver pond. I began taking notes on the spruce forest when I noticed two brown 'lumps' across the pond to my south. The first was the root mass of a fallen tree, but when I glanced at the second I noticed movement. Was it a brown leaf flicking in the wind? The movement repeated, and soon the entire lump moved slightly. With the movement I saw a head, ears, and yes, two large antlers. I made eye contact with the very moose who had marked this area as his territory (if it were a different male moose I'd be instead witnessing a fight between the two!). I'm sure he soon realized I was not a moose. We watched each other for a time. He wiggled his ears a few more times, and made a soft, repetitive grunting sound. I'm not sure if he was directing the sound towards me, or was still hoping there was also a female moose nearby. I certainly wasn't going to walk closer to a rutting bull moose, so after we watched each other for a while I disappeared back into the thick fir forest along the pond. 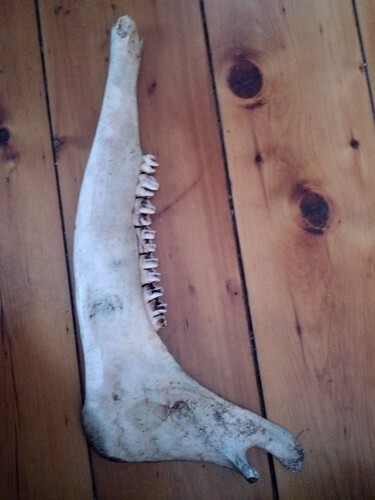 Above: A moose jawbone found in a different part of Victory Basin. A moose biologist told me that this moose was perhaps two years old when it died. Fall is coming to Vermont, and the maples are already starting to turn vivid shades of yellow, orange, and red. Among these maples is a tree that is known for its preference for slow-moving water - silver maple, or Acer saccharinum. Above: the silver maples along Lake Champlain were already starting to turn colors in late August. I've mentioned two other river-loving trees in this blog before - sycamores, which grows along fast-moving cobble-strewn rivers from Vermont south, and cottonwoods, which favor sandy areas like river sandbars and lakeside beaches. Silver maples are a bit different, though. They thrive in areas where water settles in during the spring, and stays there - sometimes for several months! Above: this area of Lakeside Floodplain Forest along Lake Champlain is dry right now, but you can see a high-water line on the tree trunks. Some trees along Lake Champlain have high-water marks over 6 feet up the tree, probably from last year's record-breaking flooding. In Vermont, Silver Maple occurs in lakeside floodplain forests along Lake Champlain as well as in riverine floodplain forests along our larger, slow-moving rivers and streams. It is especially common on natural levees. 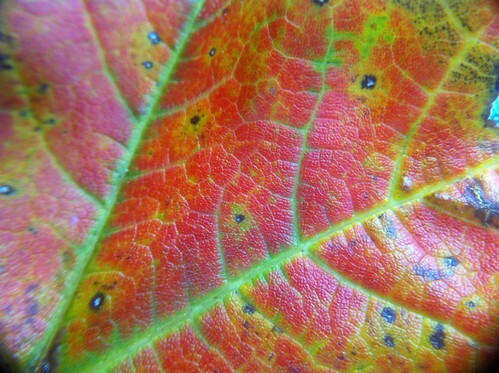 In northern Vermont, it can sometimes hybridize with red maple - which is odd, because while red maple commonly occurs in swamps, it doesn't often occur in floodplain forests. Above: silver maples near an oxbow lake along the Clyde River. Silver maple can survive being inundated for several months each year. It is actually a bit similar to baldcypress in its habitat and ecological niche, though these trees are not related (baldcypress also can't survive in Vermont - it's way too cold). 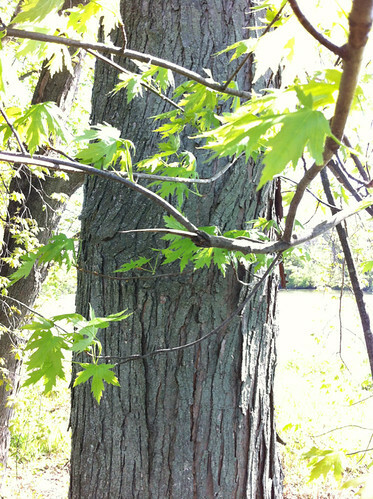 The best way to find silver maple is by looking in a floodplain near a large river, but it can also be identified by it's very deeply divided leaves and its shaggy bark. Silver maple is native to a large chunk of the eastern United States as well as some of southeastern Canada. 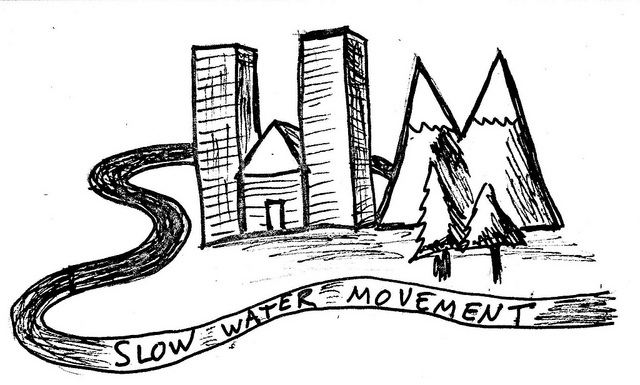 The above picture is from the US Forest Service silvics manual. 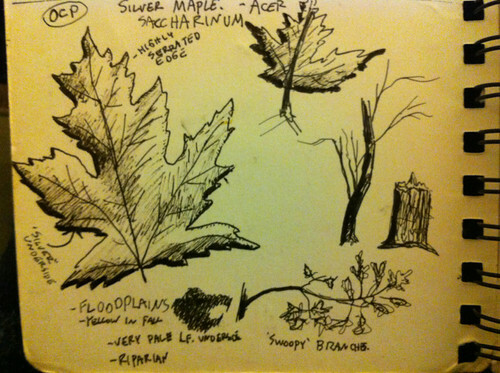 Perhaps the most important value of silver maple is in its ability to reduce erosion and filter water during floods. 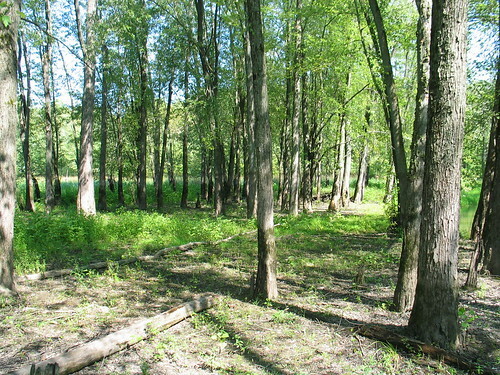 Sadly, as many floodplains have been developed or river flood cycles altered, large stands of silver maple are not as common as they once were. It is also widely planted as a landscape tree. Silver maple timber isn't especially valuable, probably in part because of the contorted form of these trees. Likewise, the tree can be used to produce syrup, but it reportedly doesn't taste as good as sugar maple syrup, so there isn't much reason to bother with it. Its natural habitat is often iced over or flooded during sugaring season anyway. Squirrels and beavers eat portions of the tree and ducks and other birds nest in its branches. The shade it provides to waterways is beneficial to cold-water fish such as trout. It is also valued for the other plants it grows in association with - in particular ostrich fern, which produces the delicious fiddleheads that are often eaten in New England. 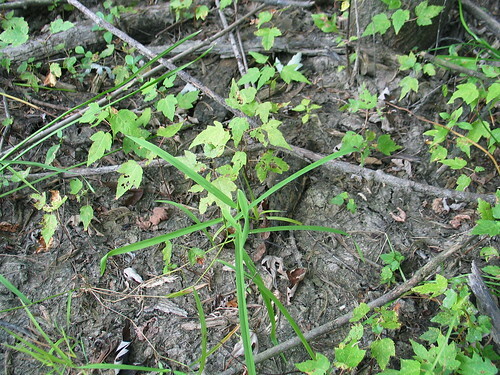 Above: Silver maple seedlings sprout the year after severe lake flooding in Lake Champlain. As these trees grow, beavers will cut down some of them to eat the bark, and squirrels will eat their spring buds. In time a few of them will replace the larger silver maple trees towering over them and continue the life of this forest. So, if you're out enjoying the fall foliage this year in New England, stop by a river and enjoy the silver maple - it isn't as vibrant as red maple in the fall, but still quite beautiful, and the ferns under the trees also turn pleasant rusty brown this time of year. Just about any large river in New England will have some silver maples on its banks, but if you're in Vermont, Ethan Allen Homestead in Burlington has a very accessible silver maple forest just a few miles from downtown. Or you can check out where I've observed silver maple trees on iNaturalist (note that only the 'pointy' markers on that map have exact location). 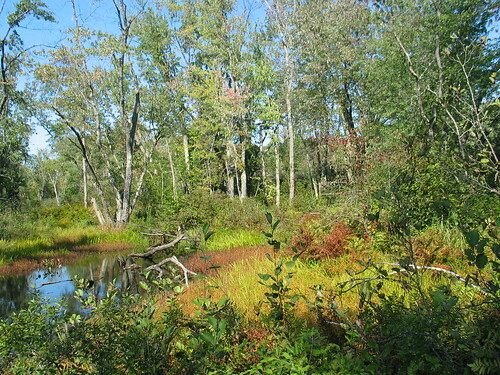 Above: a small patch of silver maple in a Wildlife Management Area in Addison County that is also open to the public. There is also a boat launch here, so you could explore the flooded forest by canoe or kayak in the spring. 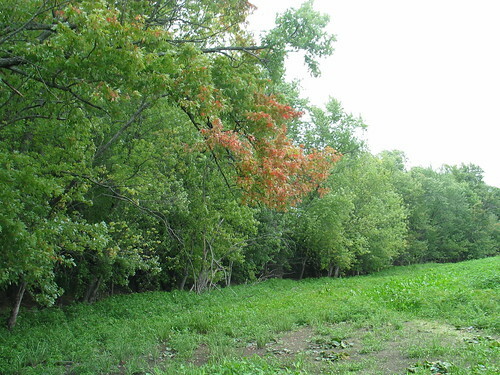 The area is popular for fishing and duck hunting, and both ducks and fish also benefit from these trees. What Does This Winter Hold? This Saturday another round of severe storms blasted through Vermont, but unlike previous severe thunderstorms of this year it brought something with it: cold air. Yesterday was a cool day and today even cooler - Montpelier never got out of the 50s today, and an early fall chill is in the air tonight. Some of the coldest parts of Vermont will probably even get a mild frost tonight. Winter is still several months away, but with trees starting to turn color, squirrels hoarding acorns, and geese starting to act restless, people are starting to talk about what the next winter might hold. A week or so ago my girlfriend was at a farm in a cold part of rural Vermont and a local resident pointed out a woolly bear caterpillar and noted that the abundance of brown fuzz on the caterpillar might mean that a cold winter was on the way. I've heard elsewhere, though that more brown fuzz indicates a milder winter, or that more fluffy fuzz means more snow. I'm more inclined to trust the local knowledge, but at the same time, the caterpillars aren't sending a clear message, at least not one I know how to read. The maple trees are sending a less ambiguous message. Regardless of whether it is warmer, colder, snowier, or drier than average, colder weather is on the way, and soon. Even a slightly warmer than average Vermont winter can see significant periods of subzero weather. But what are other people saying? Well, the Farmer's Almanac predicts 'cold and snowy' for northern New England, but most Vermont winters are 'cold and snowy' by overall US standards, so I'm not sure if they are calling for an especially snowy year, or just the normal cold weather we get every year. The Accu-Weather forecast does not mention anything in Vermont at all, which I suppose is a forecast for a normal winter, but does mention later in the forecast that weak to moderate El Ninos like we may be having tend to bring snowy weather to New England. NOAA made a rather vague forecast last year - somewhat above average precipitation, and an equal chance of warm, cold, or average weather. The precipitation was below average and the temperature above average. This year the current forecast as of early September (they are updated fairly often) calls for above average temperatures and has no precipitation trend forecast in Vermont (but perhaps stormier than average conditions along the New England coast). Note that this forecast simply says that there is a 40% chance of above average temperatures, and a lower chance of colder than average or normal temperatures. This is averaged over the entire time period, and doesn't mean some periods couldn't be very cold. And of course, the forecast could just be wrong, like they all were last year. 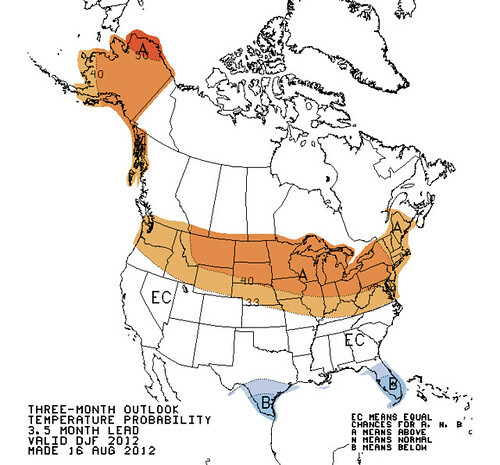 Above: NOAA temperature forecast for December 2012-February 2013. See the link above for more maps. I'm not going to make a winter forecast for Vermont this year, because I don't think there are any strong signals one way or another. I will note that overall monthly temperatures have been above average for a very long time - I think over a year - so unless there is a significant pattern change we can guess that it may be a bit warmer than average. In addition to current jet stream patterns the climate of the whole globe is warmer than in the recent past, causing an increased likelihood of warmer temperatures overall. BUT, somewhat paradoxically, the warming has melted much of the sea ice in the Arctic, and there are indications that the lack of Arctic ice can move the jet stream and actually lead to blizzards and Arctic blasts over places like Vermont. Similar phenomena were documented in several Northern Hemisphere areas over the past few years, including last year (just not in the continental US that time). So... it's possible our string of warm conditions will be interrupted by a harsh arctic blast of the kind we haven't seen in many years. So all I can say for sure is it should be interesting. I will say that I have seen indications that the Vermont oaks are possibly 'concerned' about a future weather event, though it may be that the indicator I use to monitor this (which seems to correlate with California drought) may just have been triggered by the dry summer. We'll see! For those of you in California, the climate indicators are much more strong this year. We're probably heading into a weak to moderate El Nino, and as many people already know, El Nino tends to correlate with above average, sometimes torrential rain in southern and central California. Not all El Nino years are wet, but averaged over all the El Nino years we have records for, the average precipitation in California is much higher than non-El-Nino years. Hopefully California will see some drought relief, and perhaps Texas and Florida as well. 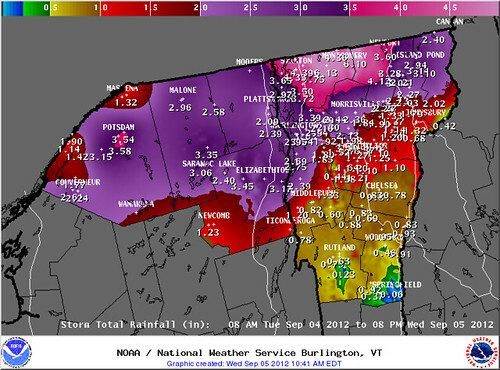 Northern Vermont had a somewhat surprising soaking last night. If the weather forecasts for a few days ago, the headline for this post could have been Isaac's Remnants Selectively Soak Southern Vermont... which would have sounded better, with alliteration and all. That isn't what happened, though. The low pressure area containing copious moisture from the remnants of Hurricane Isaac made a last minute jog to the north. Anyone north of a line from Virgennes to Saint Johnsbury got soaked, while those to the south of that line experienced a run of the mill late summer storm. The Adirondacks got a drenching as well, and apparently also southern Quebec, though I don't have precipitation figures from there. Burlington picked up more than 3 inches of rain last night, the most it's seen out of one storm since Irene came through last year. Some of the northernmost parts of Vermont picked up more than six inches of rain! Here in Montpelier we were right on the edge of the heavy rain, and we picked up between an inch and 1.5 inches of rain overnight. The North Branch of the Winooski has risen, though not dramatically so, because it has been so dry. Further north, where heavier rain fell, river raises were more dramatic with the Missisquoi River raising almost EIGHT FEET overnight! It actually rose a bit over flood stage in Troy. I haven't heard of it doing any damage, but it's certainly an unexpected event in this otherwise dry summer. For most of Vermont, and indeed most of the areas affected by Isaac, the rain was welcome despite the problems it caused. Meanwhile, way out in the Atlantic, Leslie has fought off wind shear and has become a hurricane. Leslie isn't going to hit New England as was previously considered a slight possibility, but is likely to seriously impact far eastern Canada. By traveling north and strengthening, it will slow down a front passing over Vermont this weekend, perhaps contributing to another storm somewhat similar to the one we just had. Since most areas picked up heavy rain this time, we need to watch out for possible flooding this weekend. Fall is building in, and it's certainly a change from the dry summer we've been having. Incidentally, it isn't only the eastern half of the United States being impacted by moisture from dissipated hurricanes. Scattered showers from a tropical remnant are also affecting much of California. Rainfall totals have been very light, but this is still the dry season, so any precipitation is unusual. There is also the chance of dry lightning that could cause fires. As fall builds in, people have begun talking about winter, especially here in Vermont where winters can be so dramatic. I'll have a post about some of the winter forecasts being thrown around, soon. Hurricane Isaac just slammed the New Orleans area, causing a great deal of flooding to Plaquemines Parish to its south. It also killed quite a few people in Haiti. While it never got beyond Category 1, it was a very large, wet, and slow-miving storm, and dropped as much as 20 inches of rain in New Orleans! (in comparison, the disastrous rains of Irene in Vermont last year were mostly under 10 inches). A wet storm wasn't welcome in New Orleans, but it sure was to the north as it moved up the Mississippi River Valley. That area is experiencing very severe drought, and the deluge that just passed through the area helped reduce the drought quite a bit. Unfortunately, it was too late for many farmers. Above: NOAA map of drought conditions. Jeff Masters' blog has a lot of great info about this hurricane and its positive and negative effects. The expression "it's an ill wind that blows no good" seems to apply here. Many natural disasters have upsides to some, even as they harm others. Irene pulled Vermont together in a tremendous way, though I would definitely say Irene blew much more ill than good for Vermont. Isaac, on the other hand, may actually be remembered as much for its benefits as its harm, at least in the US. (Haiti, on the other hand, has horrific flooding in almost any storm, because its extreme poverty has caused people to remove all of the trees from their slopes, resulting in extreme watershed degradation. The deaths in Haiti are tragic but seem more related to social and environmental factors than the severity of Isaac per se). Isaac will even probably kick some moisture into a front crossing Vermont early next week. We could certainly use the rain here, though we haven't had as severe drought as most of the US. Speaking of ill winds, it's worth keeping an eye on Tropical Storm Leslie. It may be far from land, but some computer models have showed it possibly impacting the east coast of US or Canada. It's far too far away to be concerned about yet, especially since many computer models show it dissipating harmlessly at sea. But, it's good to be prepared. On a side note, I have to apologize for the lack of photos in my blog. My iPhone died, and I won't have a new phone for a few weeks as I've opted to try out the new iPhone 5 rather than buying an older one. We'll see how that goes!